I often see the question, “What do I need to get started in my planner?” come up in Planner Groups on Facebook. Well… the planner world can be quite intimidating. You get on Instagram and see all these fun layouts that looks like a scrapbook factory vomited all over someone’s planner. You think … yes! I want Scrapbook Vomit! My life will not be complete until I have it!!! And then you get your new planner… and it’s empty… a vast blankness stares back at you and you get scared… and close it… and wonder what you’ve gotten yourself into. I hope today’s Top Ten List can help you in your journey to planner peace… whether it be Scrapbook Vomit, Minimalist, Memory Keeping, Bible Journaling or more. If you don’t have your planner yet… check out Blitsy (they sell the Happy Planner) or Erin Condren… Both sites offer $10 off your first purchase! Ink Joy Gel– These are all the rage right now! Washi Tape– Washi all the things! Find Washi (decorative paper tape) at crafts stores, on Etsy, office supply stores, amazon. Use Washi to add flair to your pages, cover your mistakes, spruce up your days. Washi Washi Washi! Etsy… Oh My Etsy. Be prepared to buy all the things. You can find stickers for EVERYTHING… and I mean EVERYTHING on Etsy. And if you can’t find it… you can find someone who will make them. Check out my shop’s selection of stickers HERE. Michaels, Hobby Lobby, and Joann have TONS of stickers to choose from! Be sure to grab a coupon before you go! Don’t have time to go looking for stickers? Don’t want to wait for them to ship. Head over to Pinterest and type in Planner Sticker Printables and prepare to be amazed! SO MANY BLOGS (like mine) offer FREEBIES. Check out this great list that was put together by the Planner Squad. You can also go on Etsy and look up Planner Sticker Printables to buy. Check out Ninja Mom Designs Printables on Etsy. Sticker Paper- If you’re going to be printing out all those goodies- you’ll need sticker paper! For a good price and high quantity, check out THIS. If you want a little higher quality of paper, go with AVERY. A Laminator– not a must, but certainly fun to have, especially if you want to make your own cover or wipe off inserts. Scissors– You will likely be doing a lot of cutting- cutting your washi tape, your stickers, bookmarks, etc. Get yourself a nice pair of scissors! A Happy Space to call your Own– Whether it’s a small corner of your bedroom or an entire room dedicated to crafting, find a space to make your own. I have my supplies in an antique vanity that I inherited from my grandmother. Some people like using THIS CART. I also have a Large Zipper Pouch and Double Duty Caddy from Thirty One where I store my supplies. What about you???? 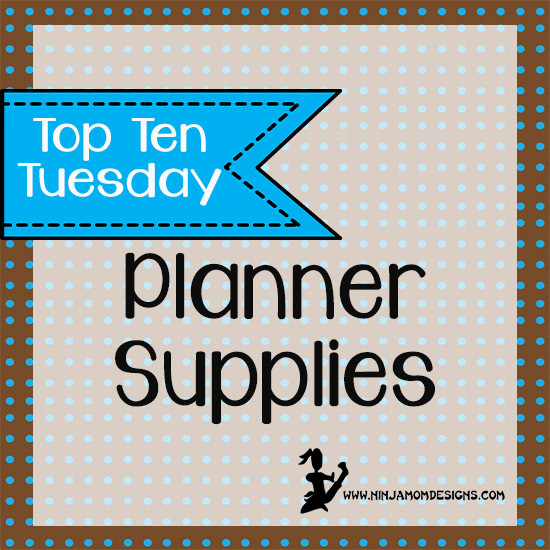 What are your must have planner supplies??? ?